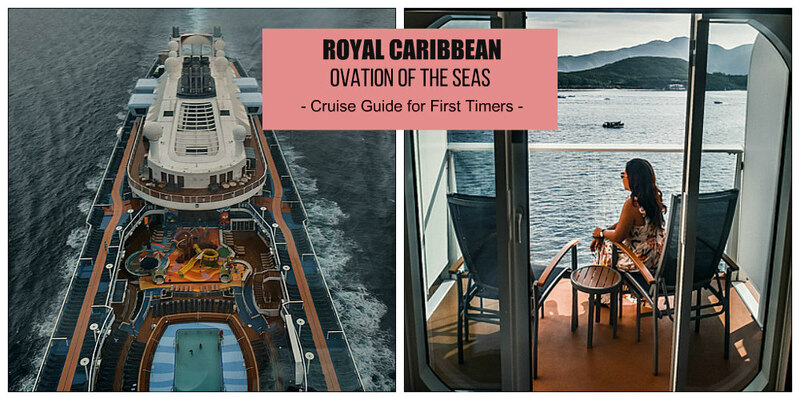 Detailed guide on Royal Caribbean Ovation of the Seas for first timers. With cruise information, things to do and activities aboard the ship, answers to frequently asked questions on cruise vacations, and tips + reminders. From time to time, I try different ways of traveling besides the usual budget trips, like enjoying a luxe vacation on a cruise ship. 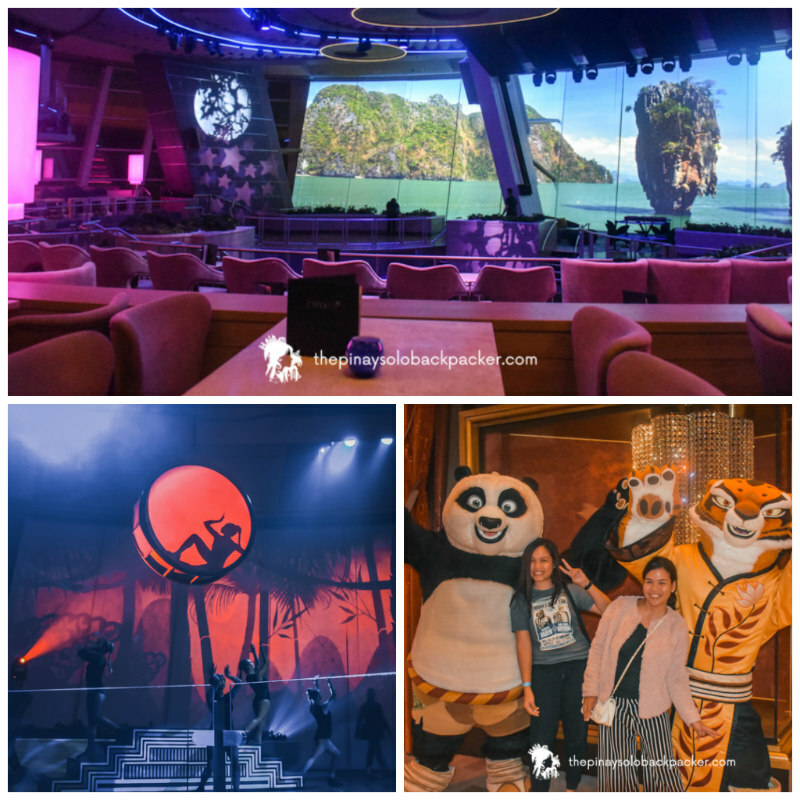 This time, I found myself draped with opulence aboard the Ovation of the Seas, under the fleet of Royal Caribbean. 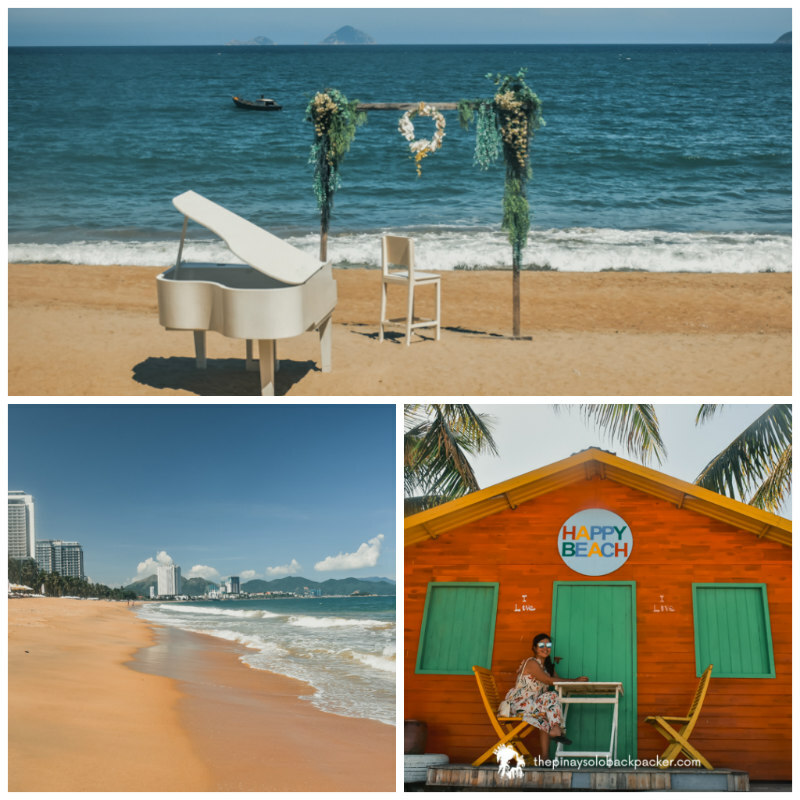 The cruise vacation lasted for 7 days, from Hong Kong to Vietnam, and it culminated in Singapore. Cruise vacation offers a different travel experience, and thankfully, nowadays, it’s getting more reasonably-priced. Royal Caribbean Ovation of the Seas is Asia’s largest ship and one of the most technologically advanced ships. It’s not my first time on a cruise holiday, so I wasn’t really expecting to be swept off my feet like the first time, but truth is, the massive, supremely stylish ship still made my jaw dropped. 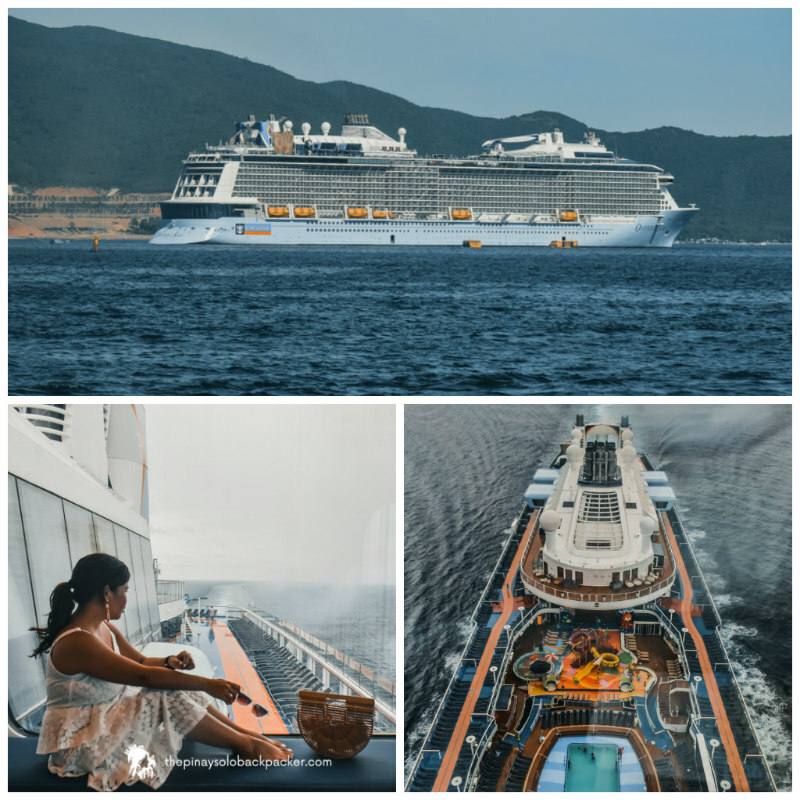 Hopefully, this comprehensive cruise guide blog will help you consider and plan your cruise vacation with Royal Caribbean soon. How to book a Royal Caribbean cruise? How much is the cost of Royal Caribbean Cruise? What is included in Royal Caribbean’s Cruise ticket price? 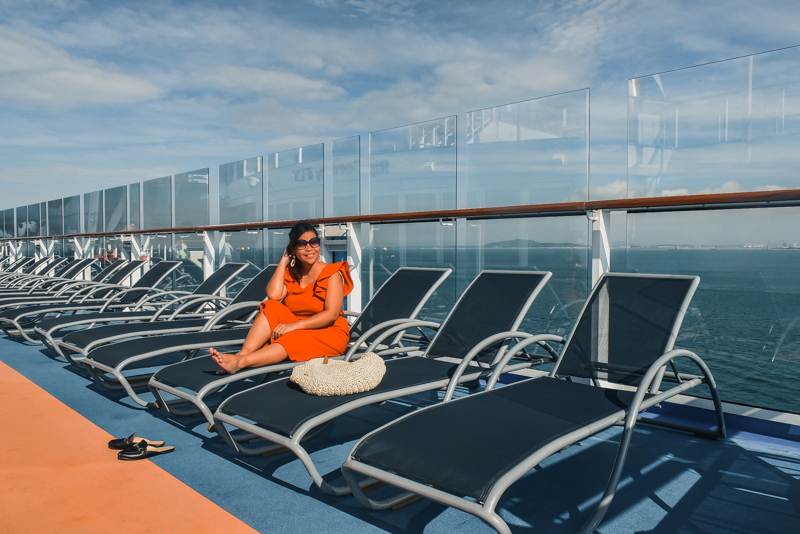 Can a solo traveler enjoy a cruise? What happens if I get sick or there’s a medical emergency while on cruise? Do I need to get off the ship and join the shore excursion? Passport + Visa: Prepare your travel documents like passport, visa (if needed). 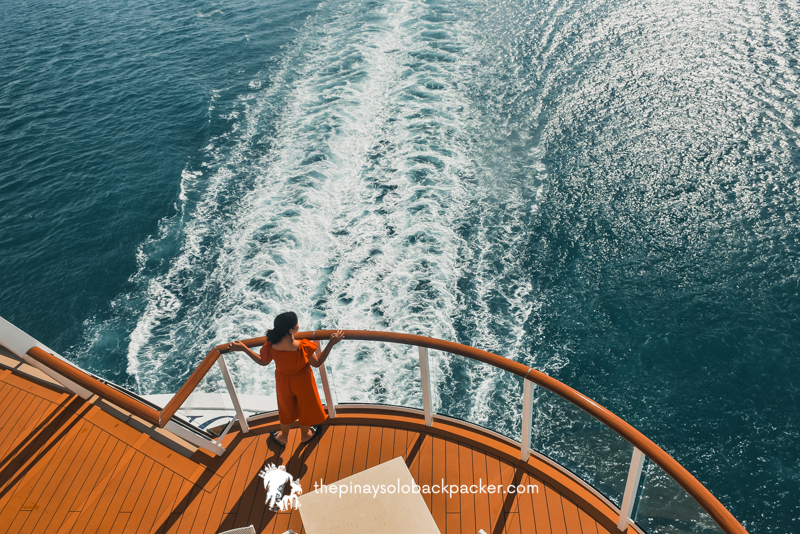 But if you are a Philippine Passport holder and you will be joining the Hong Kong – Vietnam – Singapore cruise. No visa needed. Passport will be collected upon check-in formalities. Tip: Keep a photocopy of your passport, credit card information, and insurance information. You can save a copy of it at home or in your laptop or external hard drive where it can be accessed in case needed. Documents: In case the last name of the parent with child is different, you should present the child’s valid passport book and visa (if required), including the child’s birth certificate (original, a notarized copy or a certified copy). The name of the parent and child must be linked through the legal documents. If the child is traveling with an adult who is not a parent or legal guardian, s/he is required to provide the child’s birth certificate (original, a notarized copy or a certified copy) as well as a signed authorization letter (original and certified copy) by at least 1 parent. This will be collected upon check-in formalities. Travel Insurance: Purchase a travel insurance. Health: All guests must ensure they are medically fit for travel. Check with your doctor at least 4-6 weeks prior to sailing to make sure your health is okay and if there’s any vaccine required for you to be permitted to travel to each destination. Packing: What to pack for a cruise? Check the weather on the dates of your cruise so you can prepare your outfit. Pack like you would for any resort holiday. Cruise vacations are typically casual by day, and by evening, the dress code varies by occasion or establishment. What I usually do is, pack light and comfortable clothing and shoes for the tour, casual dress as my OOTD outfit for my Instagram posts, swimwear because I like to take a dip in the pool, a jacket because sometimes it gets cold inside the ship, and I throw in a formal wear for formal dinner and shows. Toiletries: I recommend bringing your own toiletries like shampoo, toothpaste, and toothbrush. Even though the ship provides body wash on dispenser, they try to avoid single-use plastic, so they provide those miniature bottled shampoos, body wash, toothpaste, and plastic toothbrush. Still, you can request them from Guest Services. Money: The currency on the ship is USD. There is an ATM on the ship, beside the Guest Services. Money exchange is available, but during our cruise, they run out of Vietnamese Dong. Power Socket: Take note that extension wires aren’t allowed on the ship. Bring a travel adapter. Drinking Water: Bring a water bottle to refill your drinking water. You can refill drinking water at the Café Promenade. Arrival: Arrive more than 30 minutes prior to your scheduled check-in time. Security Check: The process is like checking in on a flight at the airport. You need your passport and visa (if required). You will go through security check first at the port. They have a list of passengers provided by the ship, so you won’t be allowed to go through Immigration if you’re not on the list. Check-in: After passing through the security check, you will go to a table where they provide you the SeaPass card (access card) before you board the ship. NEVER LOSE IT. It’s the most important item when you board the ship, it serves as your cabin room keycard, and sort of a credit card when purchasing anything from the ship. You will be provided an instruction as to where to proceed inside the ship to surrender your passport to Immigration. Important: The charges on your Sea Pass card needs to be settled a day or a few hours before you disembark the ship. Otherwise, you won’t be allowed to leave until your bill is settled. You will also use the SeaPass card when disembarking the ship for shore excursions and when returning to the ship. In case it gets lost, proceed to the Guest Services to report it immediately and for replacement. Boarding: After claiming your SeaPass Card, you may go through another manual security check before boarding. Then you need to tap your SeaPasscard upon entry to sort of an electronic entrance. Immigration: Find your room first and leave your things. Proceed to the deck where you need to surrender your passport to Immigration. Yes, there will be Immigration Officers on board, they will stamp your passport and you need to leave the passport with them. You will be handed a landing card, never lose it. You need to show it every time you get off the ship for shore excursion. You claim your passport before disembarking the ship on your final destination, usually the night before your last day onboard. There’s a mandatory muster drill for all guests before the ship sails. The drill will explain the safety procedures in case of real emergency. You’ll learn where to proceed/escape. You will find the key details and location of your Muster Station and proper use of life jacket at the back of your cabin door. Royal Caribbean Ovation of the Seas is Asia’s largest ship, and one of the most technologically advanced ships. It boasts of 2,090 staterooms with spa-like comfort and luxurious amenities. 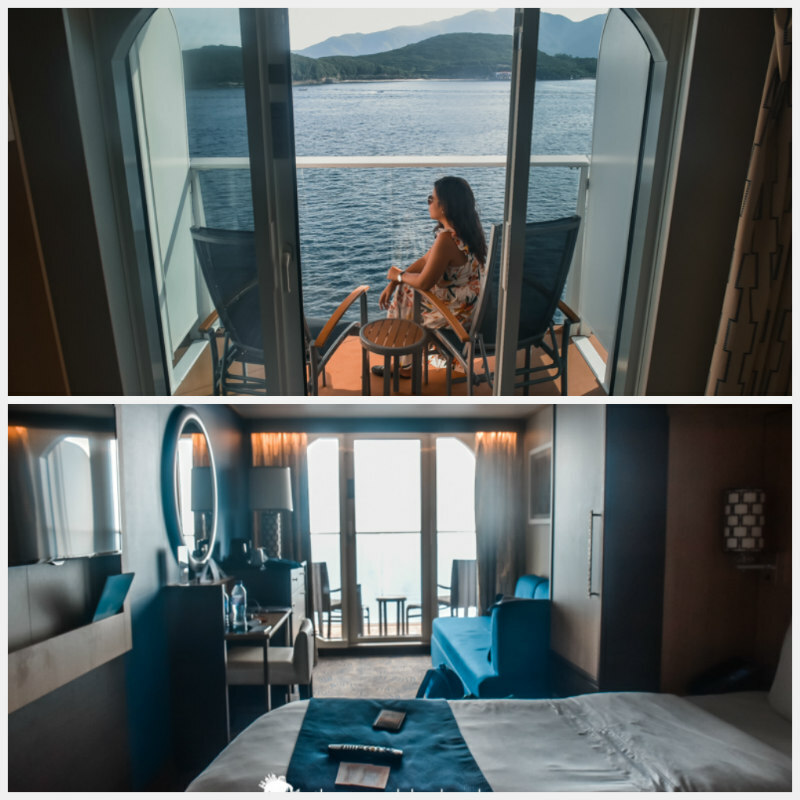 I was invited by Royal Caribbean Philippines for a cruise, and I was assigned to the Ocean View Balcony; this stateroom can accommodate up to 3 guests. The cabin made use of its space seamlessly, a bit larger than the cabin of my previous cruise ship experience. The cabin’s layout includes a private balcony, and it has a small sitting area with a double sofa, a perfect place to curl up for a good read. There are two twin firm beds that convert to a Royal King bed for your good sleep. The cream-walled room is adorned with a flat TV, the carpeted floor induced a swanky feel, and the bathroom has enough space for me to move around. The 2 wardrobes were just enough for the clothes of me and my roommate on our 7-day cruise. It has a small safe where you can leave your valuables, a chest of drawers, and enough room under the bed to store our luggage. And oh, the dresser has this lovely ring light around it, a perfect light for shooting your portrait photos or taking a selfie. There are 2 USB ports to charge our devices like phones, tablets, etc., Make sure you pack a travel adapter. Extensions aren’t allowed. The staterooms are equipped with kettle, tea bags, sugar, and milk. The bathroom has enough space to move around. As I mentioned above, toiletries are limited because they try to avoid single-plastic use. But there’s a soap/shampoo dispenser at the shower area. There’s no toothbrush or toothpaste, so make sure you bring one. You can request for body lotion and conditioner at no extra charge. Interior Stateroom: Has 2 twin beds that convert to Royal Sitting bed, sitting area with sofa, vanity area, and bathroom. Can sleep up to 4 guests. Size is 166 sq. ft. Interior Stateroom with Virtual Balcony: With 2 twin beds that convert to Royal Sitting bed, sitting area with sofa, and full bathroom. It has a gigantic high-definition screen that provides a real-time view of the ocean destinations. Junior Suite with Large Balcony: With 2 twin beds convertible to king bed, one double sofa, small sitting area, private bathroom with a tub, and a large private balcony. Size is 276 sq. ft.
Oceanview: With 2 twin beds that convert to a Royal King Bed, one double sofa bed, and a private bathroom. Size is 182 sq. ft. and is good for up to 4 guests. Grand Suite: It has 1 bedroom, living area and a private balcony. Good for 4 guests. Grand Suite with 2 Bedrooms: Has two sets of two twin beds that convert to a king bed, 2 bathrooms, and a living area with a sofa bed. Grand Suite with Large Balcony: Has 2 twin beds convertible to a king bed, one double sofa, sitting area, and a balcony with private dining. Size is 351 sq. ft, good for 4 guests. Owner’s Suite: This luxurious suite has one-bedroom separate living area, and a private balcony. Size is 541 sq. ft, good for up to 4 guests. Sky Loft Suite: Has 2 floor connecting lofts with private balconies, and dining areas. Good for 4 guests. Size is 673 sq. Ft.
Royal Loft Suite: This 2 floor suite can accommodate up to 6 guests. It has 2 twin beds that convert to a king bed, king size bed with Duxiana Mattress, and one double sofa bed. Size is 1,640 sq. Ft.
There’s a plethora of restaurants inside Ovation of the Seas, you won’t run out of a place to eat. Many of them are complimentary. Windjammer Marketplace (FREE). This is where we usually dine in Ovation of the Seas, it’s a dining mainstay located at Deck 14. The Windjammer offers buffets made up of international fare for breakfast, lunch, and dinner. You can choose from beefs, lamb, chicken, pastas, salads, soups, sandwiches, and desserts. Menu changes daily. If you like to dine in a hurry, go here as there is no waiting time. But it can get pretty crowded in the morning as most passenger dine here, best to go there early to secure a seat. Attire: Casual, fully covered shoes, and shirt is required. The Grande (FREE). We were assigned at The Grande and the staff here are very friendly and helpful. It’s a fine-dining style and it’s free. Solarium Bistro (FREE). For fresh and healthy comfort food that are delicious yet low in calories and fat, head to Solarium Bistro. I like the ambience here, less crowd, and situated near the pool. The menu is made by Devin Alexander, the best-selling author of 8 cookbooks, he’s also the Chef of NBC’s The Biggest Loser. Jamie’s Italian by Jamie Oliver ($39 per person). This is my favorite restaurant at Royal Caribbean Ovation of Seas because the food here is uber delicious. Chef Jamie Oliver may be famous in Britain but he sure loves Italian cooking. We tried the famous Plank piled high with cured meat, pickles, and cheese. I especially love the mushroom fitters here! Wonderland ($49 per person). The food here are bizarre, the chefs give them a twist that you’ve never seen before. We were provided with a brush for the menu to find our element, be it Earth, Ice, Water, Fire, Dreams, or Wind and they based the food served from your element. Izumi (Ala Carte). Because I was craving for Japanese food, I asked Lexie to accompany me to Izumi and it was all worth it. The Filipino staff are really accommodating and I especially love their tempting sashimi. The food served are Asian-inspired with eye-catching presentation. Café Promenade (FREE). This is where I’d usually go for a snack. They serve delicious cookies and sandwiches, and I’d usually take it to my room and eat it there. If you have a drinking bottle, you can refill water here. Sorrento’s Pizza (FREE). Just beside the Café Promenade is this café that serves really simple yet tasty pizza. I’d often go here for a quick bite. Bionic Bar. We love the drinks here, and the two robotic bartenders who’ll create, mix, and serve you the drinks. The genius behind this game changer is Makr Shakr. To order we had to use the app on the tablets provided on the table, then watch in awe as the bionic mixologists shake up our drinks. 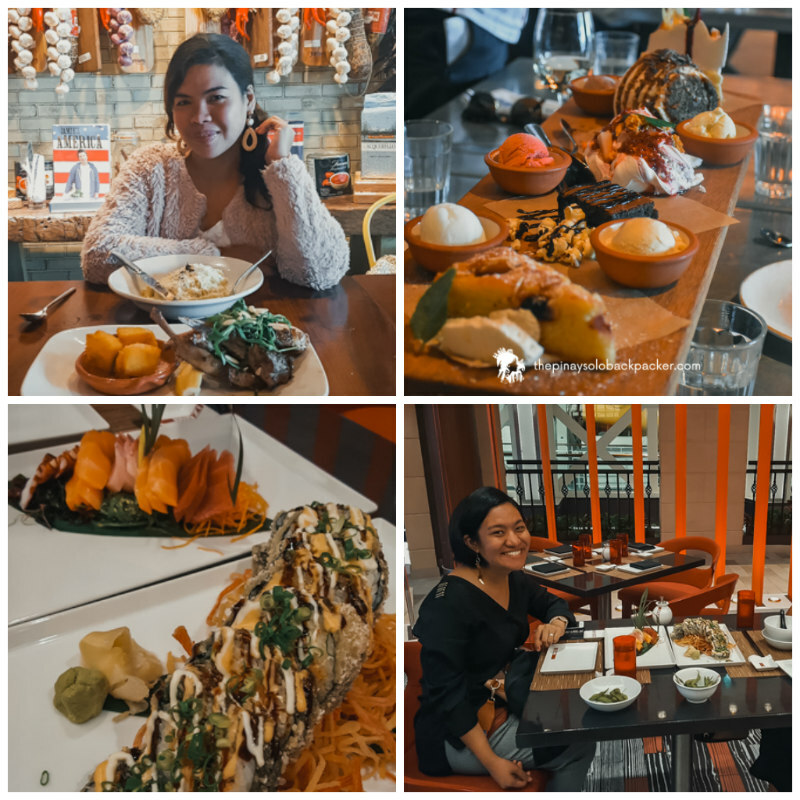 No worries, if you are a first timer and you can’t figure out how to order, there’s a reliable Filipino staff to assist you. Age Restriction: 21 + on sailings from North America, 18+ on sailings from South America, Europe, Asia, Australia, and New Zealand. The Café @Two70, Pool Bar, Diamond Club, Schooner Bar, North Star Bar, Sunshine Bar, Boleros, Seaplex Doghouse, Vintages, La Patisserie, and Chef’s Table. Pool (FREE). 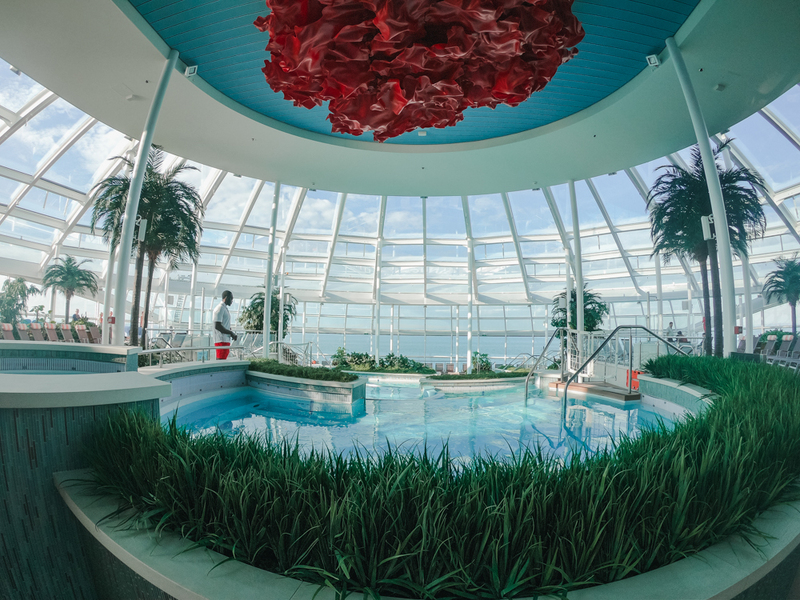 Royal Caribbean Ovation of the seas has 3 main pools – the main outdoor pool with movie screen (you can watch movies here at night), the indoor adult’s only pool of Solarium with retractable roof, and the pool with water parks for kids where you get a tan on the sun lounger while sipping cocktails. Shops. The Ovation of the Seas is like a giant hotel and shopping mall, where you can rest, dine, and go shopping! Luxury brands often have a mini sale, you can buy bags, wallet, watches, perfumes, etc. at discounted prices! I bought a couple of authentic branded perfumes here as a gift for my family, and I’m so giddy because I saved a couple of bucks! Gym (FREE) and Spa. I didn’t get to try these two but in case you like to work out and burn those fat because you’ve been indulging on food while in cruise, this is the place to be. Aboard the ship, there’s an abundance of perks. 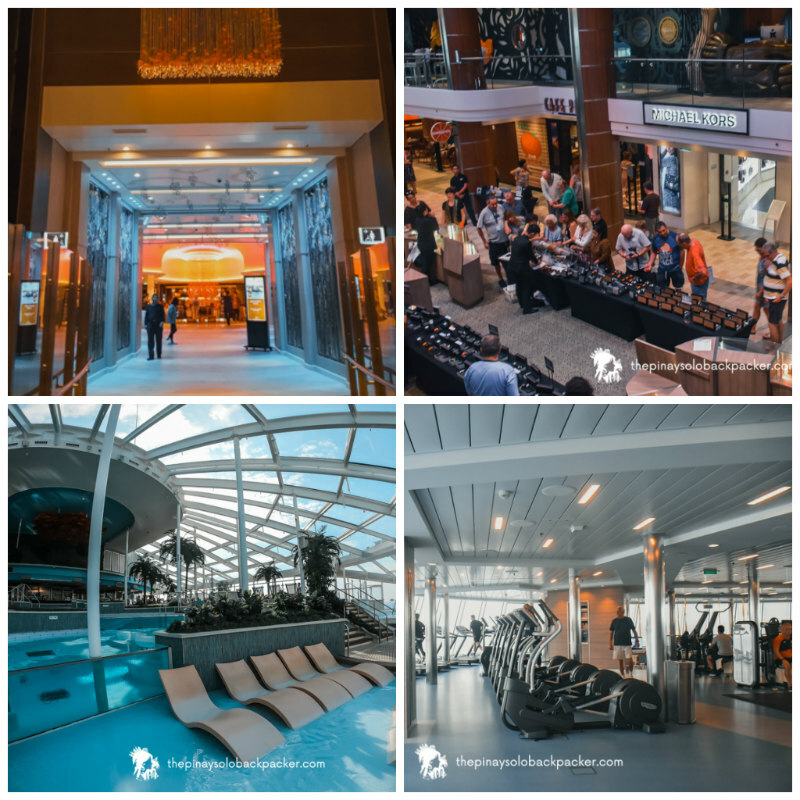 There’s plenty of activities inside Royal Caribbean Ovation of the Seas to make sure you won’t get bored! Ripcord by Ifly (FREE). My personal favorite. Try this gravity-defying adventure! I was honestly scared at first, but it was worth the risk! If you haven’t experienced skydiving yet, this is a good starter as it will let you experience how it feels to float in the air without leaving the ship. The instructor is there to guide you for your safety. Bring socks and rubber shoes. Restriction: 3 years old and below. Those shorter than 6’ must weigh less than 103 kg, while those 6’ and taller must weigh less than 113 kg. North Star (FREE). Another must-try! Ride the North Star for an exhilarating 360-degree view of the ship and ocean from 100 meters above sea level! Just line up or reserve at cruise planner. Weather permitting. Restrictions: 107 cm to ride/122 cm to ride alone. 136 kg/300 lbs. maximum. Rock Climbing (FREE). If you are the adventurous type, climb the 12 meters rock climbing wall beside a giant panda. It’s free and you can do this over and over again! Age Restriction: 6 years old. Bring socks, T-shirt, and shorts/pants. Flow rider (FREE). 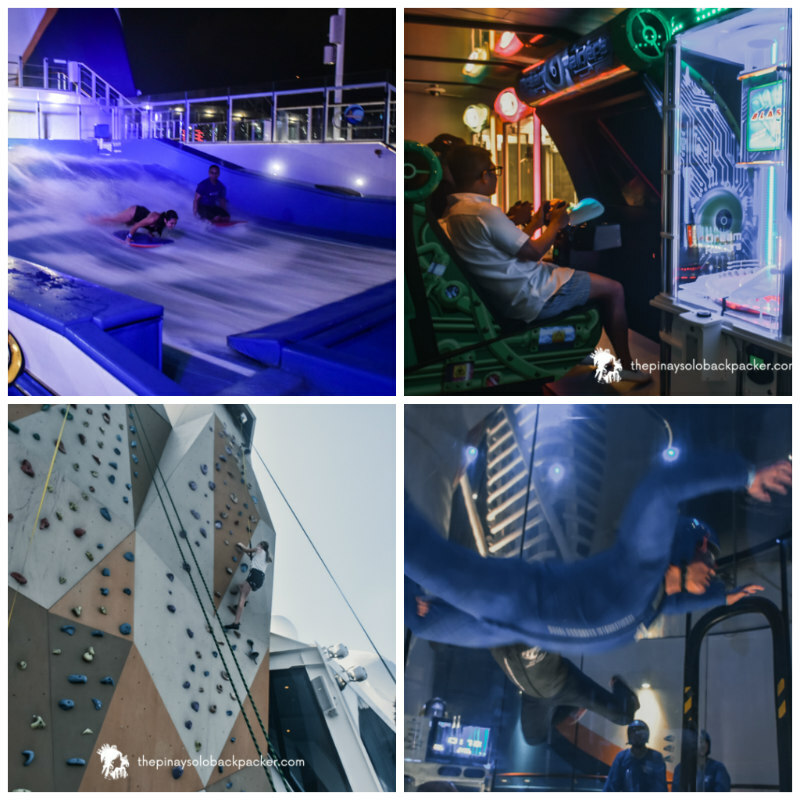 Surf while on board the Royal Caribbean Ovation of the Seas with the 12-meter-long surf simulator! No reservation required, just wear the proper outfit, queue, and surf instructors will be happy to assist you. Your family and friends can even cheer watch and cheer you while your catching the waves! Restrictions: Boogie board height requirement is 1.32 m, stand up 1.47 m.
Waterpark (FREE). Have lots of fun as you get drenched by water with fountains, water cannons, whirlpools, and go sliding on colorful waterslides! Arcade (Free). Play your favorite 80’s and 90’s game like Mario Brothers, and other games such as air hockey, Fast and Furious Drift in this place! Seaplex (FREE). This Seaplex has a massive basketball court that transforms into a roller-skating rink, bumper cars, and even dance floor! You can even play Xbox here! Restrictions: For roller skating, kids under age of 6 must be with a parent/guardian while on court at all times. For bumper cars, must be over 5 years old and 42 inches tall. If guests is between 5 and 8 years old, an adult driver is required. Table Tennis (FREE). You can also play table tennis on the ship and join the tournament with other passengers. Two70 (FREE) and Royal Theater (FREE). Be mesmerized by jaw-dropping shows, robotics and video projections. We watched the Pixels performed a quick show and the live performance, and the artsy video projections was truly mesmerizing. You need to make reservations for most shows at the Cruise Planner. And if you reserved a spot at the VIP lounge area, you can even enjoy drinks prepared by a personal bartender. The Music Hall (FREE). This performance hall is the place where guests can enjoy exclusive and intimate access to live performances, the hottest music, DJs, and themed night parties. By day, the Music Hall transforms into a workshop venue. Outdoor Film Nights (FREE). You can lounge on the pool deck and watch movies at night as the sea breeze touches your face. Royal Caribbean Ovation of the Seas Wi-Fi is impressive, the fastest Wi-Fi I’ve experienced in a cruise ship to date. That’s because they have invested heavily on their onboard Wi-Fi, they have their own satellite on board! Their Wi-Fi is called Voom, but it’s not free. The staff at Royal Caribbean Ovation of the Seas are really polite, friendly, and helpful, especially the Filipinos and Indonesian. Our stateroom attendant Diwa was pretty helpful and always makes it a point to greet us and even practiced some Filipino greetings for us. Shore excursion or Shorex is the part of the cruise where you can get off the ship to tour the places around or near the port where the ship is docked. You can book a tour through the cruise ship or do a DIY tour it’s up to you. Shorex: If you book a shore excursion with the Royal Caribbean Ovation of the Seas, you need to meet up before the tour. Check your departure time, ask for the meet up location and time. You need to claim your sticker and ticket, you will not be allowed to board the tour bus without it. 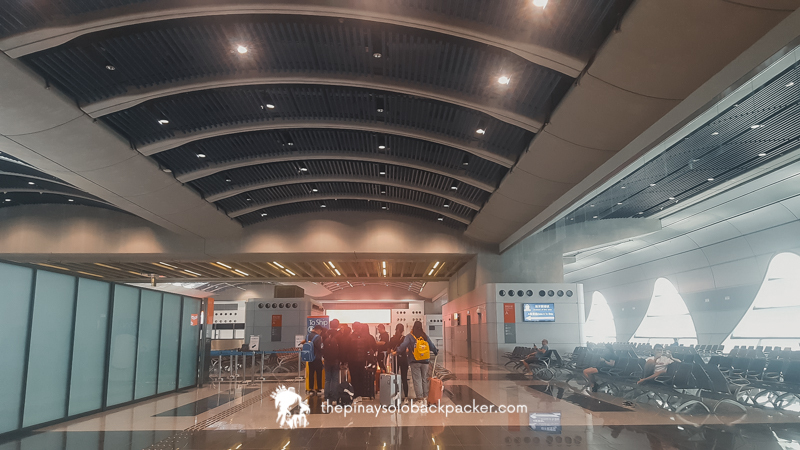 This is recommended for a hassle-free trip since everything will be taken care of. There will be a guide and the tour bus will ensure that you will be back to the ship on time before its departure. DIY tour: If you book a DIY tour, you will have complete control of the tourist attractions that you wish to visit. But you have to make sure that you are back on the ship on time because the cruise ship will not wait for you! 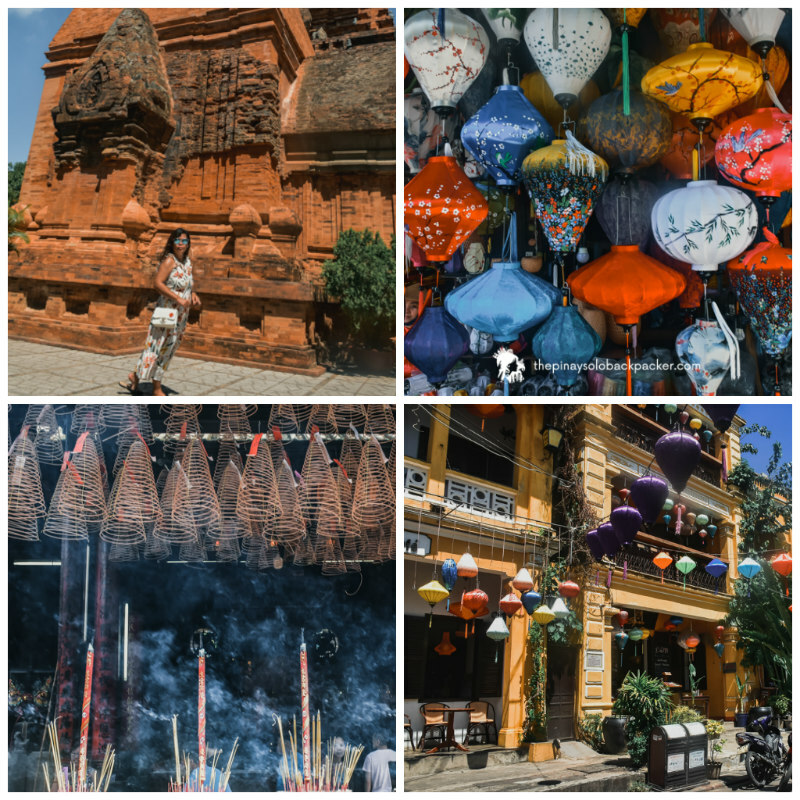 During my cruise vacation with Royal Caribbean Ovation of the Seas, we visited the following destinations: Hoi An, Danang, Nha Thrang, and Ho Chi Minh. We boarded the ship in Hong Kong and we disembarked in Singapore. Double check your departure time and meeting location and be there at least 30 minutes before departure. Always check if your clock is set to local time! Remember there’s a time difference for some countries that you will be visiting. Please make sure you bring your SeaPass card with you and the landing card as Immigration officers will be stamping the landing card. Guests will not be permitted to get off and on the ship without the SeaPass card. A security check point will be set up at the gangway for guest’s security and safety. Take note that in certain countries like Vietnam, local port authorities doesn’t allow guests to bring fruits, plants, flowers, sea shells, bulbs, and rocks onboard the ship. Claim your passport. It’s usually given on the lobby of your deck. Pack your things the night before you arrive in your final destination. Your cabin attendant will leave the bag tag on your bed on the last night, attach it to your bag. You can leave it outside your door before 3:00 AM and your cabin attendant will collect it. Claim your bag at the Baggage Area outside the ship before going through Immigration. Hand-carry your bag with gadgets and other valuables. If you don’t want them to carry your luggage, that’s fine, you can carry it yourself, no need to leave it outside your door. Settle your bills at the Guest Services before disembarking. I suggest to do it at least a day before disembarking the ship. There’s an ATM nearby if you need cash. You can pay by cash or by credit card. Go to the meet up place for disembarkation. Take note of the meet up place and time for disembarkation. The staff will announce the meet up place (usually at the Royal Theater) and time. Then they will announce when it’s okay to disembark the ship. Make sure you have your passport and SeaPass card ready. You need that to exit the ship. Exit the ship. Wait for the announcement and instruction for disembarkation. Exit when told. Passengers with hand-carry luggage are usually first to disembark. There are cruises to suit every budget and preferences. Currently, the rates for Royal Caribbean Philippines cruises start at $505.86 (roughly PHP 26,000 +) per person and that’s already for a 3 nights cruise. All prices on Royal Caribbean Philippines cruises are per person, based on double occupancy of the stateroom. The cruise rates quoted also do not include any applicable government taxes, fees, or surcharges that may be assessed by any governmental agencies. Generally, the price includes your choice of ship accommodations, ocean transportations, most meals, most beverages, most entertainment onboard, and most activities. See more details below. Gratuities, dining in Specialty Restaurants such as Jamie’s Italian, Izumi, Chops Grille, and 150 Central Park, alcoholic and non-Alcoholic Beverages (Except water, lemonade, and iced tea), Wi-Fi, Shore Excursions, transfers (Unless you purchased the sea/air package), medical Services, gambling, spa and services, art auction, photographs, video arcade, ship to shore phone calls, and laundry and dry-cleaning services. Many people often have this notion that cruise vacation is only for the rich because it is expensive, that’s partially true, yes. Thing is, nowadays, cruises are getting more reasonably-priced than ever, you can also save money traveling by taking a cruise. You can calculate the expenses by comparing what is already included in the price of a cruise versus the costs on a typical land-based trip. And chances are, sometimes, the cruise rates are reasonably priced or maybe even lower! Basically, you can enjoy your holiday onboard without breaking the bank if you don’t make extra purchases, try the free activities and entertainment, eat only on the free restaurants, and drink only water, lemonade, iced tea, milk, coffee, tea provided in complimentary cafes. While retired couples usually take a cruise, even young couples, families with kids, and group of friends also book cruise vacations. 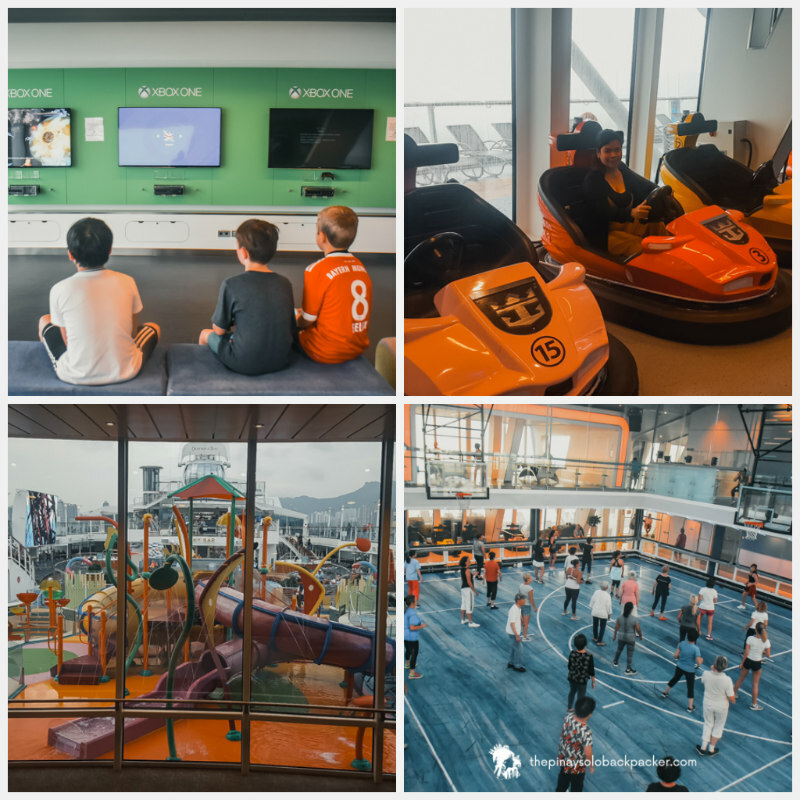 If you are worried about taking your kids, your kids will most likely be busy and entertained with a wealth of activities provided for free on Royal Caribbean Cruises, from swimming, movies, sports, etc. Of course, cruising is for everyone. If you are a solo traveler, you will meet other people aboard the ship. They also have a sort of meet and greet activity for solo passengers. Yes, it is one of the safest forms of travel. Cruise ships are designed and operated in compliance with strict requirements of international law. These ships should follow a bunch of rules and regulations for the security of its crew and passengers. The staff undergo extensive training before they can board the ship. There are licensed doctors and nurses and medical facilities aboard the ship for a fee in case you need medical attention. Not really. You have the option to stay inside the ship and not join the shore excursion, it’s up to you. Gratuities are charged to your cruise price, but you can still make additional tip at your discretion, it is really up to you. Should you decide to tip a staff, approximately $10 -$15 per person per day would be reasonable. Familiarise yourself with your surroundings; exits, stairways, evacuation station, location of life vest, etc. Inform the ship’s staff of any special requirements or allergies, etc. that you may have, especially on food. Do not throw anything overboard, at the sea, or in port. Royal Caribbean has a program called Save the Waves that works to protect the ecology and the oceans that support cruising. There are licensed physicians and medical facility on board the ship for a reasonable fee in case you need a medical service. Smoking is prohibited in all indoor public spaces, on staterooms and even on balconies. 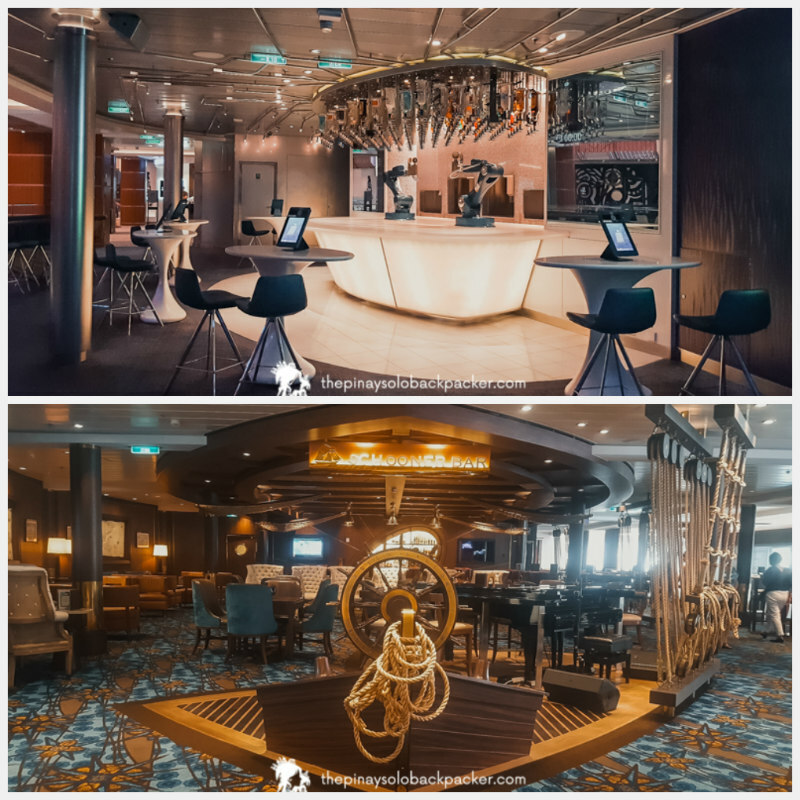 There are designated smoking areas located on starboard side Deck 5 and portside of Deck 14 and behind the big screen on the pool deck. For information on your day ahead, you can get a Cruise Compass at the Guest Services. Also, keep your TV on channel 14 every morning for activity details and other information that will be discussed by the cruise director. Always wash your hands. Sanitizers are sprinkled all over the ship, and they’re FREE. Avoid participating in risky behaviors like excessive alcohol drinking and allowing strangers to enter your cabin. Report any concerns to ship security. When booking your flight back to your home country or next destination, allocate more time before the ship’s scheduled arrival, in case of emergency situations and the ship needs to turn back to the nearest land, which will delay the arrival. This will prevent you from going through the hassle of rebooking your flights. Same thing when booking your flight to the port of origin, your flight might be delayed and you might miss the cruise ship, so best to allocate a couple of hours before the ship’s scheduled departure.